Sometimes I just think funny things: Little Umi, You Haunt My Dreams. Little Umi, You Haunt My Dreams. 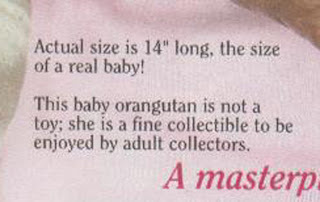 WARNING: THE FOLLOWING IS NOT FOR THE FAINTHEARTED, OR THOSE EASILY FREAKED OUT BY LIFELIKE BABY MONKEY DOLLS. Meet Little Umi, The Most Incredibly Lifelike Baby Monkey Ever! 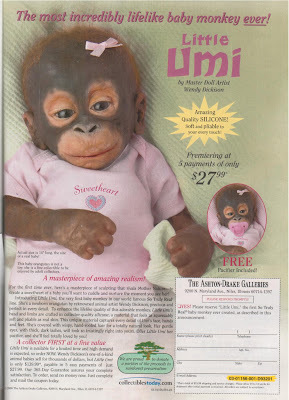 1) A Fake Monkey Baby You Can Bring to the Grocery To Freak Out Your Friends and Neighbors! "Oh, hello, Sally! Why yes, we do have a new addition to our family! Meet Little Umi!" Sally, not recalling that you were pregnant, makes an assumption that you've decided to adopt. Peeking into your new pink pram, she catches sight of Little Umi and her excitement turns to confusion. Then realization. Then fear. Sally suddenly remembers she needs hummus, and hightails it to the natural foods department, desperately hoping to run into a mutual acquaintance in the deli. 2) Tool for Oral Fixation Handily Included! It's 2:00am, and you and your husband are sleeping soundly. You hear a cry in the night, and hastily wake your husband, hand him the pacifier, and bark in his face, "Little Umi is crying! She needs her BINKY!" 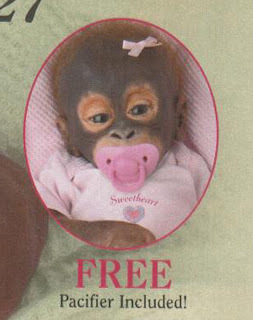 Your husband, bleary-eyed, takes the pacifier, stumbles out of bed, and halfway down the hall, realizes he's about to give a pacifier to a fake baby monkey made out of lifelike silicone. He comes back to bed, and when asked if mission was accomplished, responds, "Little Umi is one happy f*&king monkey." After being hit over the head with your alarm clock, he thinks to himself that tomorrow would be a good day to start having an affair. Delicately positioned between your Lladro wedding figurine and your Waterford toasting glasses, Little Umi will stare dully out at you from your Hitchcock dining room hutch, her lifelike silicone skin and wispy hand-rooted hair begging to be touched and held. Twice a day, you reach in, caress her face ever-so-gently, thank heaven for your little blessing, and quietly close the cabinet door. Then, you go online to buy a new Baby Bjorn so you can take Little Umi on her Sunday afternoon walk. Now don't forget, Little Umi is available for a limited time and high demand is expected, so order NOW. I'm scared shitless. Hold me, Mommy. Ahahahahaha I'm glad it's not just me who thinks this is the most ridiculous and disgusting thing ever to have been made!